Disclaimer: Keane’s supplied the fruit and vegetable box free of charge. A couple of weeks ago, I was approached by Keane’s Organic Food, who offered to send me a box full of organic fruit and vegetables. Compared with the UK a few years back, the availability of organic greens is pretty limited here in South Australia. The major supermarkets stock a small (but increasing) number of organic products, our small local supermarket stocks none. None of the local greengrocers (where we do buy most of our greens) focus on organic produce and we are just not the kind of family to manage regular outings to farmers markets bright and early on a Sunday morning. At least one of us is having a lie in! Keane’s Organic Food is a South Australian owned and operated business that started in Unley in 2008 and has since expanded (which forced a name change) to cover much of Adelaide’s metropolitan area. 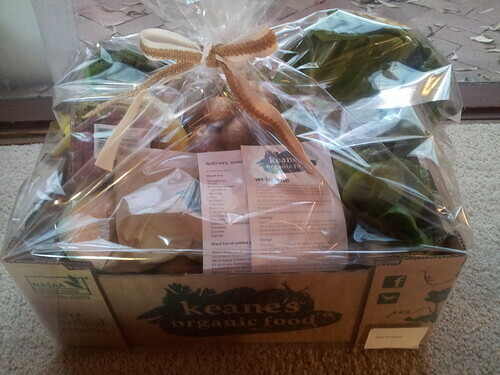 Keane’s delivers fruit and vege boxes as well as a range of ‘extras’ such as bread and eggs. The boxes are all $55 each (and you can order top ups of either fruit or vegetables for $15) and they come in a variety of configurations so if you only want vegetables and no fruit, that’s not a problem. You also don’t have to make an ongoing commitment – you just order what you want/need for that week. I received the ‘mixed box’ – which is about 2/3 vegetables and 1/3 fruit. The first thing I liked about the box was how well packed it was. Nothing annoys me more than spending time picking the best fruit or vegetables in the supermarket and having the milk dumped on top of them at check out. My box contained a single (absolutely perfect) peach which was securely perched on top of everything else and came out of the box in a pristine state. The quality of that peach was reflected by all the produce in box. Andy was very impressed by the young, tender bok choy (which also lasted extremely well in its stay fresh bag), the broccolini was beautiful, the avocado was spot on after only a day or so and the strawberries also received top marks. Value for money wise I thought that box rated quite highly. I easily spend $20 a week at the grocer’s for about half as much non organic produce and of course there is the convenience of having your shopping delivered to your home or work. If, like us, you have a toddler that inhales grapes and rockmelon and one person who takes fruit to work every day you may need to tweak your order to include extra fruit or a more fruit heavy selection. I also really liked the fact that nothing in the box came in gargantuan quantities. While it was a challenge for us to get through everything in a week (we failed) we are only a family of two and a half but there was such a broad selection of vegetables that most could be used fully in one meal. I thought this was great because it meant that you could plan out how you were going to use your box and, if you came across a vegetable you didn’t like, you didn’t have a mountain of it to get through. Critical in our household where only one of us likes mushrooms! Added bonuses in the box were a fridge magnet illustrating the ways in which the fruit and vege could be used and a flyer with production details of the produce (including its certification programme and where it was grown). In my box, approximately half of the produce was South Australian. 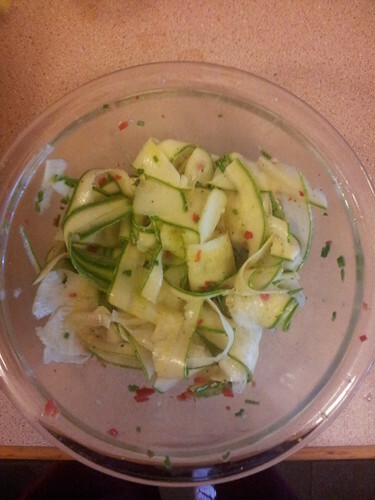 I’ll wrap up with a very simple zucchini (courgette) salad based on a Jamie Oliver original. Not only did my vege box include zucchini but my mum’s garden is currently overgrown with them! I love this salad – I’d be quite happy to eat it on its own as dinner! The quantities given will serve two as part of a selection of side dishes. And, as usual, there’s a pdf. Finely slice the zucchini lengthwise. You can do this using a mandoline or a vegetable peeler. Place in a bowl and mix through the chilli, garlic and chives and finish with the lemon juice and olive oil. Best if made a little ahead and served at room temperature.